Our Executive Office Desk Chair is one of our most popular desk chair designs and goes well with a variety of styles and decors. The Executive Office Desk Chair is built for for comfort with a 5-Star base for added stability, and a gas lift, tilt lock, and knee tilt all in one mechanism. With all of this comfort, everyone will be wondering why you're putting in so many extra hours at the office! Made of solid hardwoods, superior quality upholstery, and state-of-the-art hardware, this desk chair is strong and durable - built to last for years to come. Because it is made by the Amish, it is naturally American made as well. At DutchCrafters, we're proud to sell Amish office furniture made in the USA. How does the back look? The back of this solid wood desk chair is supported by 1.5" wide vertical wood slats, spaced 1.5" inches apart. The upholstery (fabric or leather) goes all the way around the back but you can see it only through the 1.5" gaps between the wood slats. 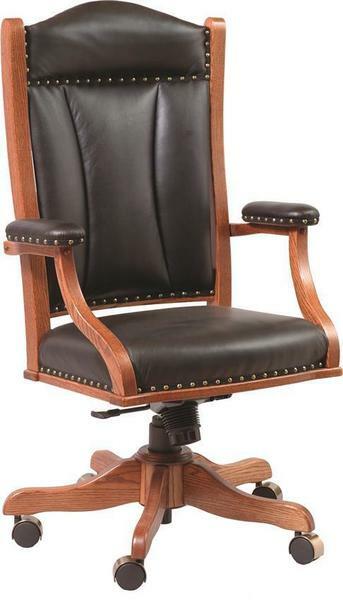 This Amish made Executive Office Desk Chair takes between 6-8 weeks for completion. Height: 43 1/2" to 47"
Seat Height: 19 1/2" to 22"
Seat Top to Arm Top: 8 1/2"
Requires kneehole space of at least 25"
We love our new furniture. Thank you all for the great communication, excellent service and professional delivery! We’ll be sure to tell everyone about our “Wonderful DutchCrafter Experience “! !